For many coffee enthusiasts, coffee pod machines aren’t the best for making coffee at home. But for busy professionals who are short on time or patience, these coffee machines are a life-saver. They are a simpler version of traditional coffee machines. All you have to do is to pop the capsule into the machine, press a button, and then voila! Your coffee will be ready in a jiffy. You no longer have to worry about the waste either since everything is contained in the coffee pod. The capsule machines bring together all the advantages of a fully automated system. If you’re looking for the best coffee pod machines in the market, you may want to consider getting any of the following machines. These coffee pod machines can serve up a great-tasting cup in a matter of seconds. Plus, they won’t let you down. If you usually drink straight cappuccinos or lattes, then this is the perfect coffee pod machine for you. This machine makes latte, latte macchiato, cappuccino, lungo or espresso with just a touch of a buttone. As a compact pod machine, you’d be surprised to know that the Lattissima Pro comes with a fresh milk carafe with automatic foaming function. The Nespresso Lattisssima has a sleek, premium brushed stainless steel die cast body that will add a luxurious feel to your kitchen. It is not just a gorgeous machine; its features have been thoughtfully considered too. The machine features 19 bars of pressure that results in excellent coffee with a velvety, aromatic layer of crema on top. Thanks to its fast-heating thermoblock, your coffee will be ready in as little as 25 seconds. It also has an intuitive touch display with 6 pre-programmed drinks, so you are one touch away from from delicious barista style beverages. Overall, this coffee pod machine is sure to give you a luxurious experience right at your kitchen. If aesthetic appeal is one of your main considerations, the Kitchenaid Nespresso Artisan would be a great option for you. It offers reassuring build quality, unmatched style, and flawless operation. Taking design cues from the rest of the Artisan range, this coffee machine is attention grabbing. It is glossy and it comes in a range of colors. The coffee maker is made from premium qualitys die-cast zinc; thus, giving you an assurance that the machine will be staying in your kitchen for decades to come. With a generous 1.4 liter water tank at the back, it is quite obvious that the Artisan was built for volume brewing. It reduces the preparation time since you no longer have to constantly refill the tank with water. The machine also features 6 pre-programmed cup sizes. You can use the dial at the front of the machine to choose your desired cup size. Just like its brand Ambassador, George Clooney, the Nespresso Vertuo Plus, is an A-list model. Nespresso is leading the market in terms of function and form. This machine does not only look great, it also dispenses premium coffee. It produces coffee with an aesthetically-pleasing layer of crema on top. The slim, rounded design means it will fit most kitchens. The water tank can also be rotated to fit the space. This machine is capable of producing various serving sizes – from short espresso to a big cup. This sleek machine has a range of 22 specialty coffee profiles, so you are to find at least one coffee variety to suit your taste. However, Convenience comes at a price. A single Nespresso capsule can cost as much as $1.20. For those who drink about 4 cups of coffee a day, it can get expensive. SELECTION: Enjoy single serve coffee and espresso cups in any size you prefer. Four cup sizes available: Ristretto (.85 oz. ), Espresso (1.35 oz. ), Lungo (3.7 oz.) and for the first time Americano (.84 oz. coffee and 4.2 oz. hot water). Pour over ice to create your favorite iced coffee drinks. 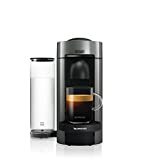 SMART COFFEE MAKER: Bluetooth technology with intuitive LED alerts connects with your smartphone via the Nespresso App to schedule your next morning brew, choose personalized coffee settings, order capsules and manage your espresso machine maintenance. PERFORMANCE: Nespresso Expert offers impeccable single cup coffee and espresso every time, thanks to its extraction system delivering up to 19 bars of pressure to fully extract the delicate flavor and aroma profiles of each Nespresso coffee capsule. DESIGN: Unique flat-to-the-wall design maximizes counter space by sitting flush to the wall and is inspired by the world of the barista with brushed aluminum finish. EFFICIENCY: Nespresso Expert espresso maker heats-up in under 30 seconds with a single touch and powers off after 9 minutes of inactivity. If you are a tech-inclined person who fancies smart appliances and gadgets, go for the Nespresso Expert. This machine makes coffee-making to a whole new level. It connects you to the Nespresso app; thus, allowing you to create your own personalized coffee. It also offers three temperature settings, four adaptable serving sizes, and an integral milk frother, so you can have your coffee just the way you like it. Design-wise the Nespresso Expert doesn’t disappoint. With an aluminum brush finish and smooth gliding styles, this coffee machine looks incredibly elegant. It has a beautiful minimalist design that is designed to grace a tabletop while being able to be tucked away when not in use. The machine is also easy to use and maintain. Overall, this coffee pod machine provides a quick, easy way to make your morning brew. The Nespresso Expert has combined style and sophistication with functionality. It offers smart technology, customizable options and great coffee. It is also more affordable as compared to lesser-quality competitors; thus, making it one of the best coffee pod machines on the market. 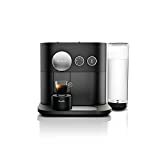 The Nespresso Creatista Plus is recommended for coffee lovers who are looking for all-rounder coffee pod machines. 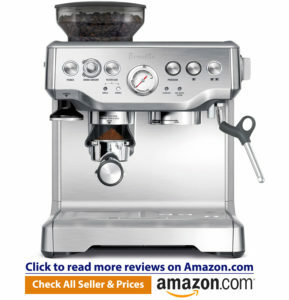 It is an elegantly designed workhorse that brews great-tasting coffee. This coffee pod machine provides plenty of options for preparing barista-style coffee. It features 8 different texture levels, as well as 11 different milk temperature settings to help you precisely control milk-froth quality. Plus, it features a 19-bar pump, so you won’t have to worry about achieving flavorful extraction. This pod coffee machine is extremely easy to use. It comes with 8 different beverage selections plus a high resolution display that guides you through the coffee preparation process. Coffee pod machines became an instant hit once they landed the market. People embraced them because they are time efficient and offer convenience. These coffee machines allowed people to make coffee they want with just a push of a button. All you have to do is to pop a capsule into the machine, push a button and then wait for their coffee. The best part is that you get the same taste of your favorite brew. One major gripe about purchasing coffee pod machines is that they are difficult to recycle. Some machines use pods that are difficult to recycle. Others even use pods that are non-recyclable. They are also quite expensive since most of these machines are compatible with a specific brand of pod. Prices vary substantially, so we suggest that you do your research first before you commit to a specific brand or model.